So the top pic is my new start of the week. 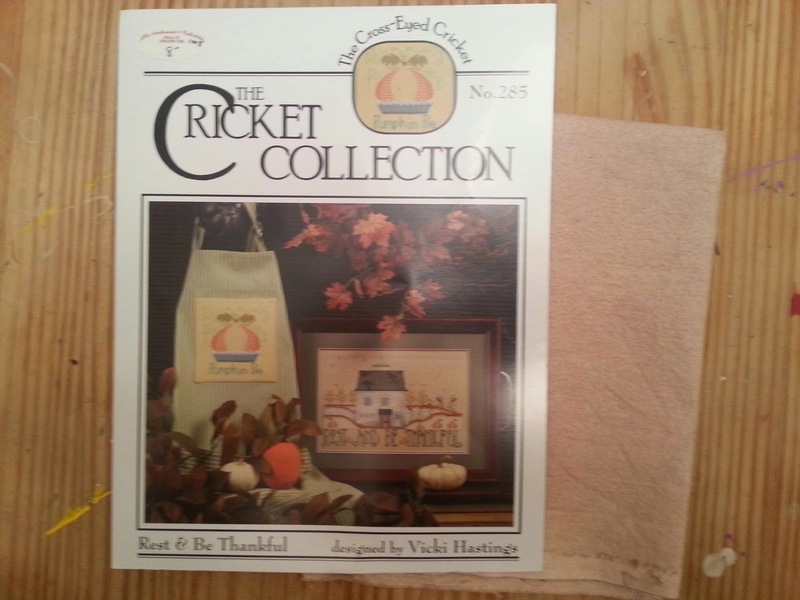 No, I haven't finished Calvin's birth sampler, but am pretty close. 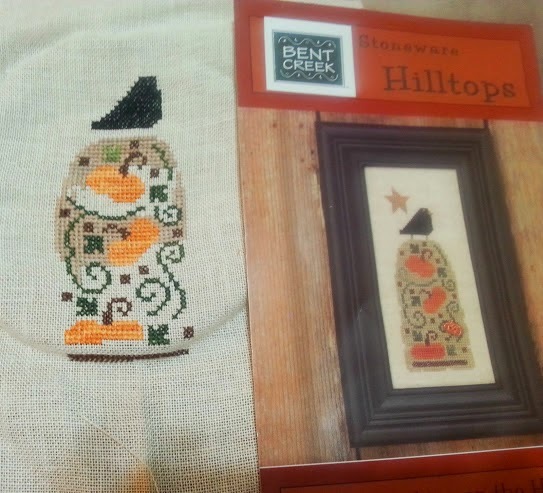 I just couldn't resist starting this once the chart arrived in the mail! I am a big fan of Bent Creek (gee all my new projects this year have been Bent Creek) so I was surprised I had never seen this series before. See the top little leaf above the top pumpkin? That was the green I originally stitched all the vines in, but once I started filling in the hill you could barely see it. Luckily it was quick to rip out and redo in a darker green. 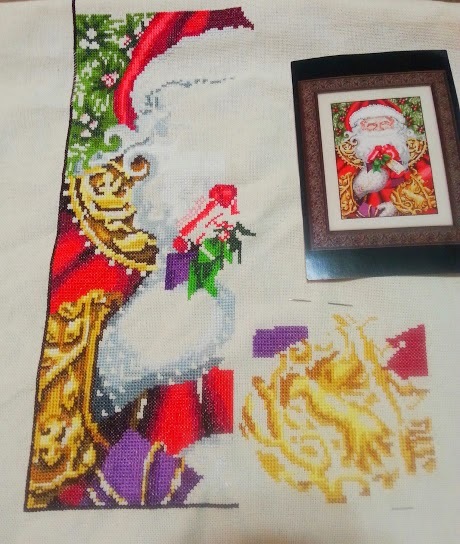 This is my progress on Mirabilia's Santa....trudging along, but hoping to have it done before the end of the school year. 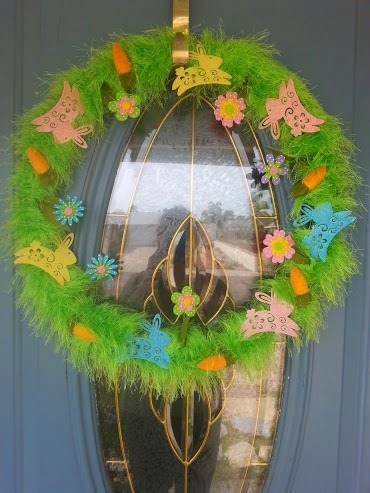 And this is my Pinterest project of the week, an Easter wreath. 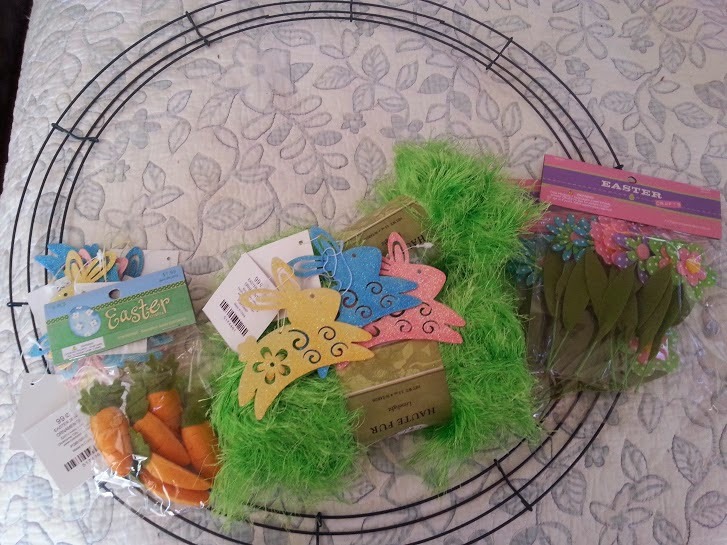 I wrapped the wire part in the fuzzy green yarn that looks just like the grass you stuff in Easter baskets, and then added the carrots bunnies and flowers. I should have chosen a thicker foam wreath though, because man it took a lot of wrapping to cover it all with the yarn! Miles Ran this Year: 102 miles...that's right i've ran over ONE HUNDRED MILES since little Calvin was born....yes i'm pretty proud of that! 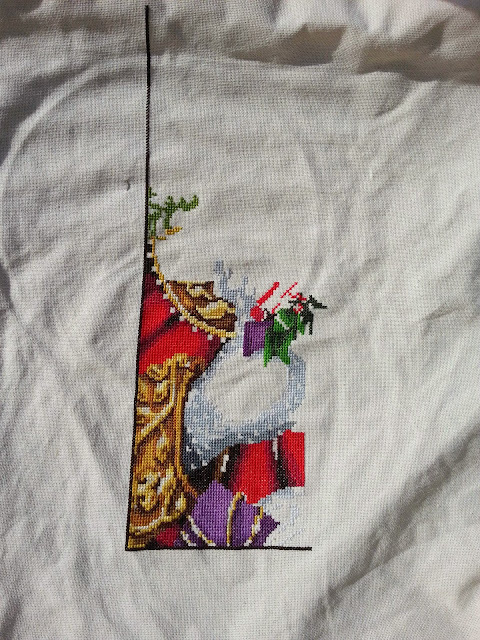 And this is my progress on Calvin's baby sampler. 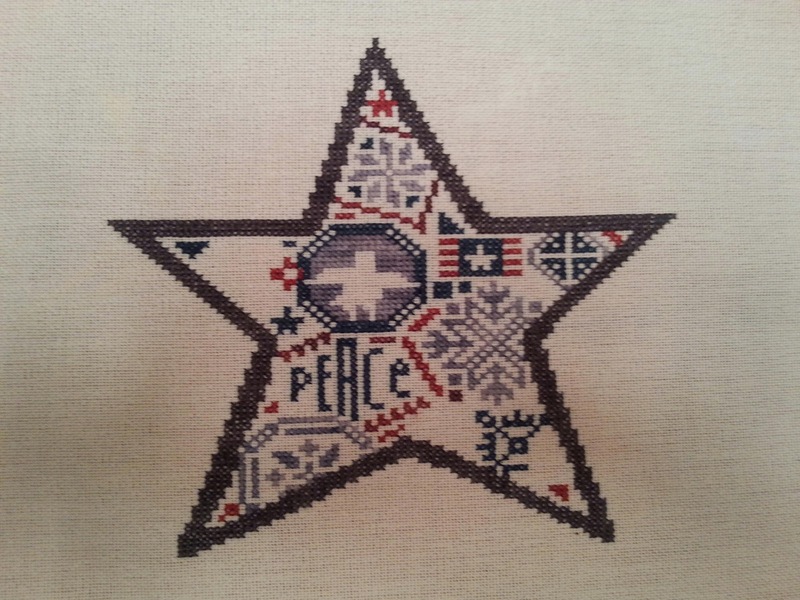 I finished another of the big words, the star and some of the border. 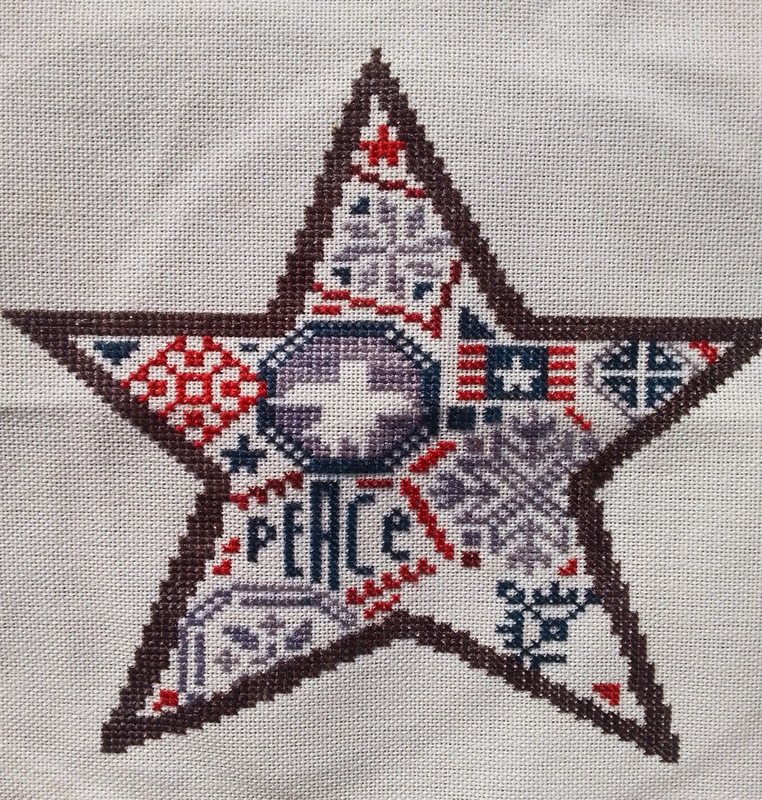 I wanted the border to be blue and green, but the threads you can't even tell their different colors! I used WDW "Bayview" which is a pretty turquoise and "Lucky" which was supposed to be more green. It's ok though I like the colors and its not worth changing it now. 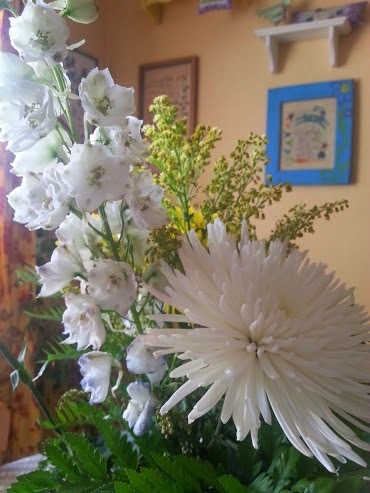 And these are the beautiful flowers my sweet husband got me for my birthday this weekend. We left baby Calvin at home with grandma, and went on a date for my birthday. It's the first time we have been out without him since he was born. We got sushi, which was a no-no for me while pregnant, and went to a bookstore and a plant nursery. All in all my idea of a great date. We bought some a pink star Jasmine vine for our garden and now our backyard smells heavenly! I just hope it survives our summer. Barb had asked when I was going to post a photo of new baby Calvin. I thought this one appropriate for the season with the clovers behind him (and he is half Irish after all). We have a huge clump of them growing by our front porch. Calvin looks a little concerned over being in that basket though! 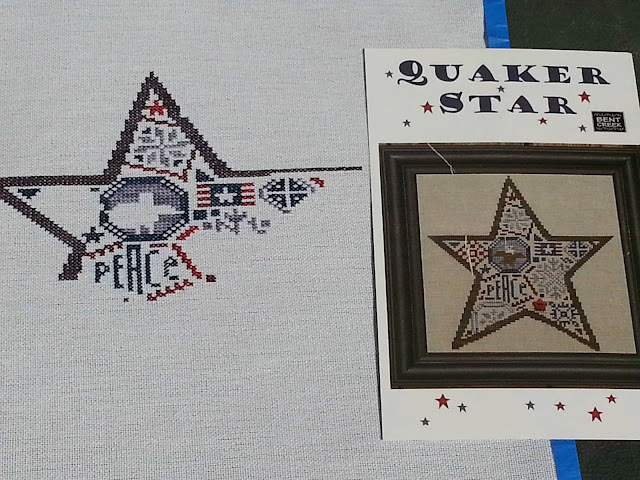 This is this weeks progress on Bent Creek's Quaker Star. I only have a few little motifs to go before I can call this one complete. I managed to fix all my mistakes on the outer star border without having to frog anything yet. 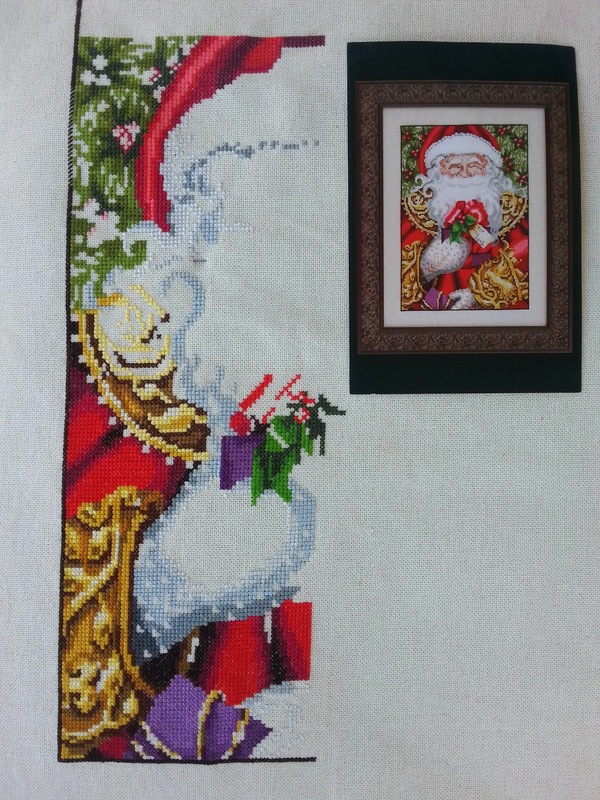 For the motif on the left point though I will have to rip out a few stitches since the red goes into the border a bit there. I even bought a cute square frame for this yesterday. It is an unfinished wood, so now I am debating what color to paint it. I was thinking either a red or a navy blue. Any opinions? I would show my progress on Mirabilia's Santa but it has all been beard stitching in lots of shades of light grey. BORING, plus it doesn't show up very well in the pictures. 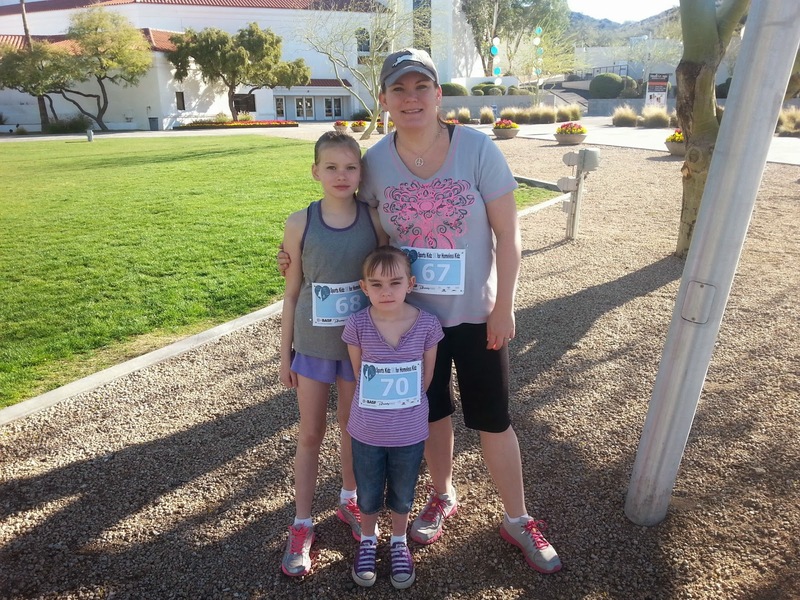 Speaking of getting back to exercising last weekend our whole family did a 5K fun run. My oldest daughter asked to start running with me, and at first I thought "uggh she's going to slow me down and that's my only alone/me time away from the kids". Turns out ten year old's are pretty fast, and she has done really well running the whole 2 miles with me on my nightly runs. Plus its nice just to have one on one time with her before the dreaded teenage years hit. She has her eye on the cross country team at school next year, and I told her if she keeps up the running she will be the fastest one on the team come fall. 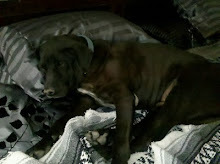 As you can see I have my laptop back up and working, so was able to organize my pictures a little better this post. It's been such a long time for me away from the blog. But lately I've been lurking on everyone else's blogs, and decided it was time to post again on my own. I've had a busy busy year with the birth of our third child just this January. 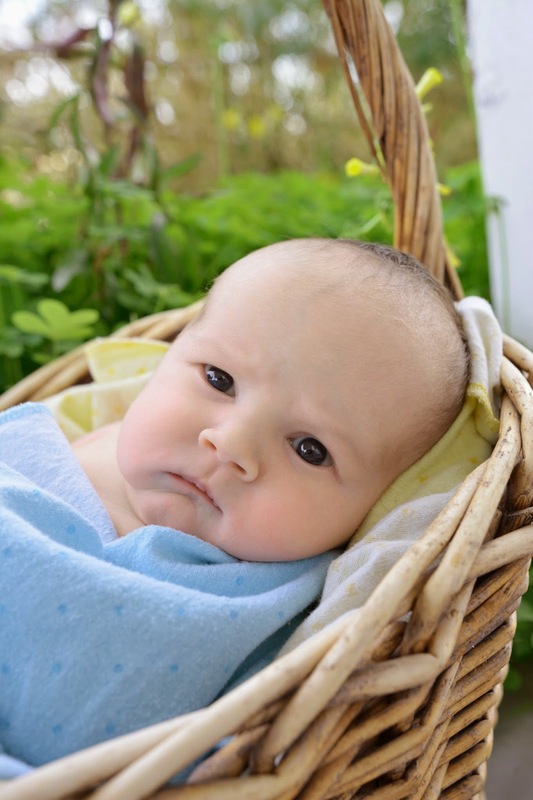 He is adorable but with seven years between him and his closest sibling you forget how much work newborns are. Well worth it though. 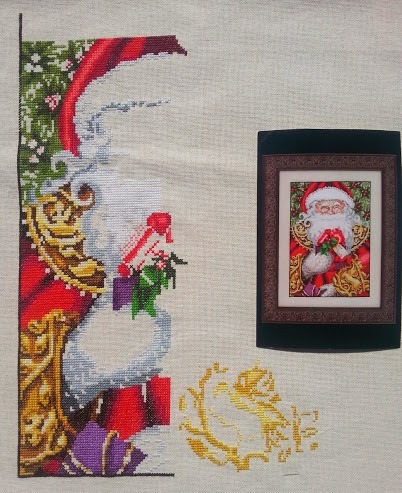 Here is my large project for the year Mirabilia's Santa. I am doing this for a friend in exchange for her tutoring my oldest child in math. This is about 2 months worth of work on it. I like it so far and I'm saving the beading (and all the white) for last. And this is my small easy project that I work on just to relax. It is Bent Creek's "Quaker star". The outer star part of it is giving me fits though and I hate hate hate frogging, I'm trying to figure out a way to avoid having to rip out the top point of the star. That's it for now. 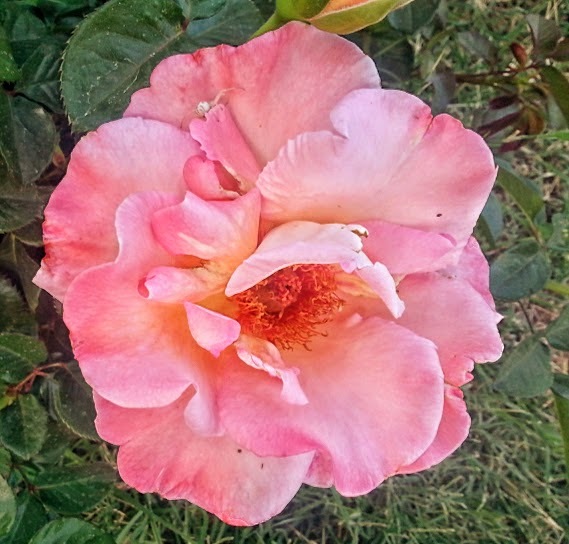 I am so enjoying getting back to reading everyone else blogs. Forgive me if I don't comment as much as I should. Most of the times I'm reading them on my phone while feeding new baby. And after posting this I realized my photos were all out of order and I can't get thrm to move so forgive me ths too...sigh my laptop was down and I was trying to use my phone but I'm not loving said phone right now. ...Grrrr!